It’s been some time since we danced, so we set off across the border to Spain to join a little community near Huelva for their monthly Milonga. We struggled with returning to Spanish in our heads and unwittingly overstayed our welcome in a café, having forgotten the change of time zone. So we turned up a little late to a Milonga in a cultural centre. I was dying to dance but the music just wouldn’t let me! It was a very strange mix of the schmaltzy and bombastic, in sets of 3 Tangos, followed by 2 Vals and then 2 Milongas. At about 1am, the DJ left, someone else took over, the music changed to D’Agostino and the group fell into a proper Tango groove with a nice Ronda too. Ah, the magic of good music! We had a few Tandas left of more traditional, if still a bit mixed up music. And now look what Totnes Tango has grown into! If we have made it this far, there is hope for every Tango community in this world, no matter how small the location! Related only by free association, here are some beautiful photos of ‘dancing’ cork oaks, taken in the woods near Faro. Underneath the Oaks we found the most aromatic thyme ever. 31st Free to tell stories again! When Peter was younger and, by his own admission, a lot fitter than now, he used to cycle around the UK a lot. Devon was one of his favourite haunts. One day, as he was cycling in the Dawlish area, he decided that for once, rather than going along the road, he would go along the coastal path. He had just gone for a couple of kilometres along the rough up-and-down footpath when he saw someone lying in an odd heap somewhere by the bottom of some cliff. 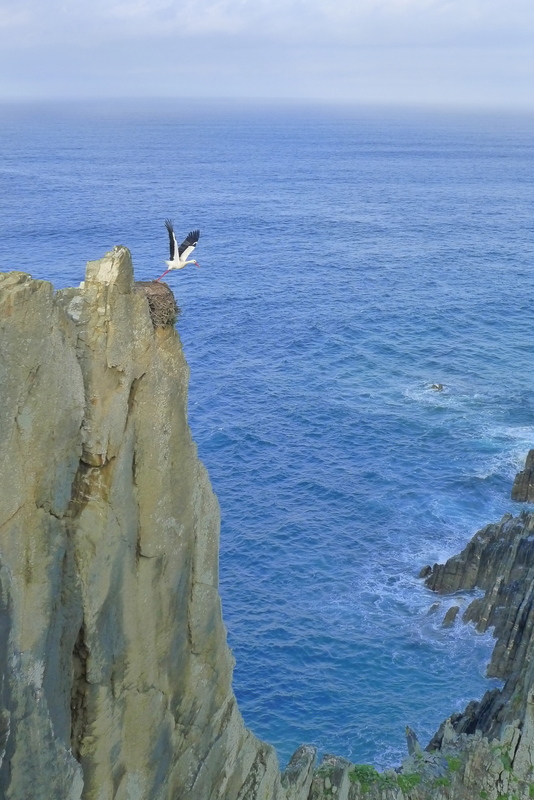 He scrambled down the rocks and found a man who had fallen and broken his leg. Peter offered to call the ambulance which could send a helicopter, but the man said, no it’ll be ok, we don’t need to call a helicopter. Please just help me to get back to the road. So Peter carried the man up the rocks and pushed him on his bike a further kilometre or two until they got to a road where they called an ambulance, which took the man to a hospital. Peter became friends with the man who was a writer and lived in a big house near the sea. Let’s call this man Hugh. Whenever he came to Devon, Peter was sure of a place to stay. Some years after, Hugh gave him a story to read which, according to him, he had written before the accident! The story was about a man named Peter whose wife had died (the real Peter’s wife had also died! ), who was an avid cyclist. One day, he cycled along the Devon coast where he found a man who had broken a leg. He helped him by carrying him up to the road. Hugh said that when he fell down by the cliffs and broke his leg, far away from any road, he though his end had come. But then someone showed up, and when Hugh found out that his saviour was called Peter, just like in the story he had written some time ago, he knew that everything would be alright. Ok., there are some if’s and but’s here – Hugh could have lied about having written the story before the accident. Peter could have spun a yarn too… after all he’s a sailor. But it’s a damn good story anyway! Meanwhile we go between Faro and Olhao, checking the post offices for a parcel that should have arrived long ago, enjoying the sunshine and the heat ( yes, it’s like a british summer here! ), making friends with a local restaurant where we get our water as well as some sumptious meals of freshly grilled fish. Frank has given quite a few massages in the last week and I’ve been doing a bit of Tango teaching too. We have met some special people. Among them a travelling french-suisse family with four delightful daughters. For someone who is not at all a patient person (thats me!) this waiting for computer repair, for parcels, for everything, is a great challenge. Today we are leaving Faro, and with it hopefully we will leave the Waiting Place, even if the parcel has not yet arrived and the computer is still in a coma. Photos of dancing trees and delightful french children playing my bandoneon will follow soon. When there is no external need for a routine, you are really faced with yourself. For the last four days, I’ve been embroiled in a fog of my own making. It feels like some kind of creative constipation, if there is such a thing. I feel the need to do something that will stretch me, that will challenge me. It’s like a growling hungry lion inside me. This feeling can be lessened by battling with my bandoneon or by sharpening my wit on the intricacies of the portuguese language, or by writing this blog… but none of those quite hit the spot. 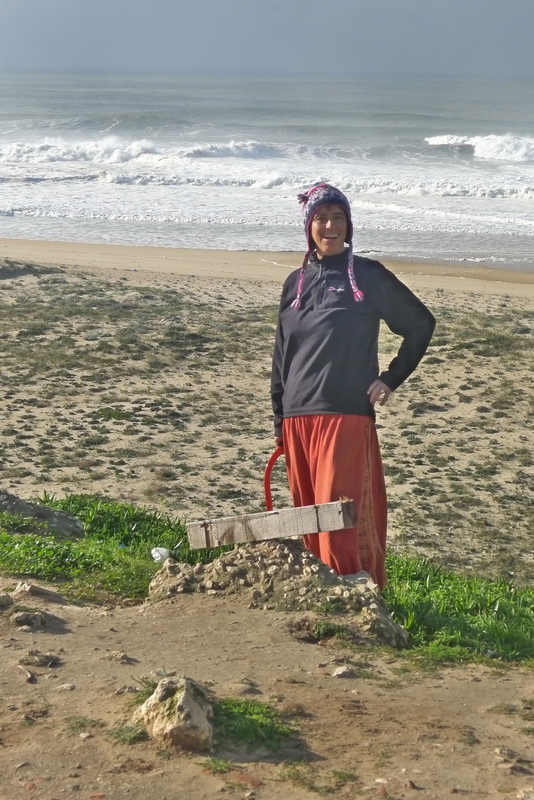 Ellen, a fellow traveller, reckons it’s about feedback. In our work, we receive feedback from the people we work with or for. When we travel, we don’t get this, except maybe from our partner. I continue to brood about this… until we meet Antoine. Experiencing Antoine lifts me out of my fog and makes me smile again. We’ve been told that the Algarve is full of campervans, and it’s definitely getting busier: Silves has one wild camping place by a roundabout – a carpark that is choc-a-bloc full – and an official Aire. So, for only the second time in our travels, we pull up at a dedicated place for campervans. 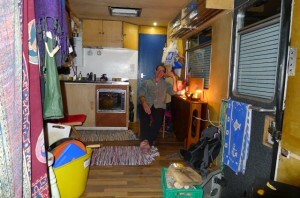 For €4.50 we can park up for the night and have use of electricity, showers and washing machine. As we drive in, we notice a bright yellow campervan that says ‘spiritual questions’ in four languages on its side. When I do my washing, I meet Antoine. I jokingly say, I have a spiritual question: What is happening in the spiritual world on Wednesdays at 8pm? As it’s then, I’ve been told in a dream, to meditate every week! Antoine invites me into his van and within minutes we are off the joking trail into deeper waters. He divines a whole number of things about me by letting his pendulum swing back and forth. What he says makes absolute sense, and I like his smiley, lighthearted and at the same time deep approach. He insists that both Frank and I should be healers, more than we already are. He offers us an initiation ritual, to better equip us for healing others. Almost every time I come in touch with people who channel energies from the other world into this one, I am told I must become a healer. It always rings true, but until now, I have always felt a yes, but not yet. This time round, I feel like the time may be right. Teaching Tango is also about healing, but what Antoine speaks about is taking it a whole level further. When we partake in the initiation, we are given the task of asking the higher energies to sustain and help us when healing others. We have hardly started the initiation when one part of myself is off on astral slides, swirling and swooshing around the place above the campervan park, flying with the storks and zipping off to other places in Europe in the space of milliseconds. I’m having a great time up there, but every time the part of myself that has remained in my body tries to remind the bit of me up there to ask the question we are meant to ask, the one up high naughtily pretends it cannot hear, or it has forgotten the question and just carries on flying all over the place. So when I have to return into my body, the question has not been asked. Antoine however assures me that it will have been heard anyway, through my being. I’m not so sure about that, it felt like my upper self was having a great time ducking and diving and playing hide and seek. It was great fun though, not at all scary, and very interesting to know what great energetic movements are happening above and around us all the time, like great swooping winds from one side of the valley to the other, with weird and wonderful shapes, sometimes big spirals, sometimes zig-zagging, and spraying colours along the way. No, I did NOT take any drugs. We were literally just touching hands. Both Antoine and Frank are slightly jealous of my experience… While Frank had also seen colours, Antoine had not seen anything. He says he often doesn’t see anything, he’s just the channel for energy to come through. To me it felt like I knew all along about these energies being there, it was familiar and it was nice to be reminded of them. They’re there all the time, and we can tap into them whenever we want! You can find Antoine on the internet. To view more photos of flying storks, beautiful beaches and sunsets, go to our flickr album. The Rough Guide’s Make The Most Of Your Time On Earth tells us that the best way to get to the heart of Lisbon is by taking the 28 tram. So we set off on our bikes, up a very steep hill, for the terminal by Prazeres, the city’s main cemetery. The Electrico 28 is a ‘Match-box’ classic, a preserved 1930’s tram. We speak to one man who remembers, as a child, hanging perilously off the side, ‘hitching’ a ride on his way to school….It has been refined from the original version by closing the sides to stop people hopping on and off, but as it hurtles through the city, lurching around corners, it feels like the tram itself might hop off the tracks at any minute. Lisbon is very hilly, and the 28E weaves its way up and down these hills, the breaks straining hard on the way down. Some of the streets are so narrow that a car wouldn’t fit through, and you feel you could touch the walls of the houses on both sides. Where the roads are wider and cars are allowed, the tram often stops and rings a furious bell at a car that has parked over the tracks. If the car is just parked near them, the tram driver may take a chance and scrape by, paying scant regard for the car’s lights or bumpers. It seems to criss-cross the town, so that by the time we arrive at the other terminal, we have completely lost our orientation. 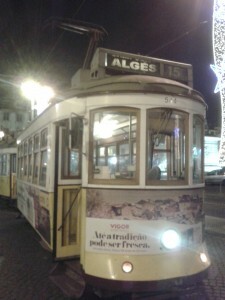 We love the old trams, and hop on and off them as much as we can in our time in Lisbon. We are charmed by the city’s feel, and we spend quite a few hours just walking around, taking in the atmosphere of the old houses, cobblestone roads, little shops and numerous cafés…. When you look more closely though, you see that a lot of the houses are closed up, abandoned, maybe just the shell of a façade with a gaping hole behind it. There is so much unused property, right in the heart of the city, it’s insane. We wonder how this will change in the years to come. We are parked up about 4km away from the main square, along the river in Belém. Philippe from the Portuguese bakery in Cardiff tells us via a text that Belém is the best place to get Pastel de Nata from. Obviously, we have to test this statement, so we try quite a few. It’s hard though to say that they are the best. Mainly because it’s difficult to remember the taste of the many Pastel de Nata we have tried everywhere else across Portugal – basically every time we go to an internet café !!! We are surrounded by a number of other campervans some of whom seem permanent residents at this car park, despite a great big sign forbidding the parking of ‘autocaravanas’ (that’d be us). Everyone is very friendly and look out for each others’ vehicles. It feels very safe and is a very convenient place to be, as there is a train station as well as tram and bus stops within a few hundred metres. We make good connections with the local Tango scene, taking part in a few events and classes. The level of dancing isn’t riveting, but the atmosphere is very friendly and I realise again that this is far more important to me than the percentage of high-level dancers. There is so much potential in this city, it’s overwhelming. We feel we should be out there, voraciously sight seeing, visiting historic places, going to concerts, meeting people etc. but instead, with each day, our strength seems to be waning until one day I kind of fall ill.
Maybe it is because we are surrounded by noise at night: a busy road has heavy lorries rumbling by, occasionally thundering over a manhole, trains arriving every ten minutes, a big bridge making a ghostly howl every time a lorry crosses it, airplanes coming in to land, and the pontoon on the river rubbing against the posts growling like a hungry lion…. I didn’t think it was disturbing my sleep until we escaped and parked up by the sea, some 80km south of Lisbon. Ah, the peace! Only the crashing of waves, but somehow this is an entirely different sound, it seems to clear the brain and replenish the body. Go figure why the crashing sound of a lorry on a manhole has an entirely different effect. 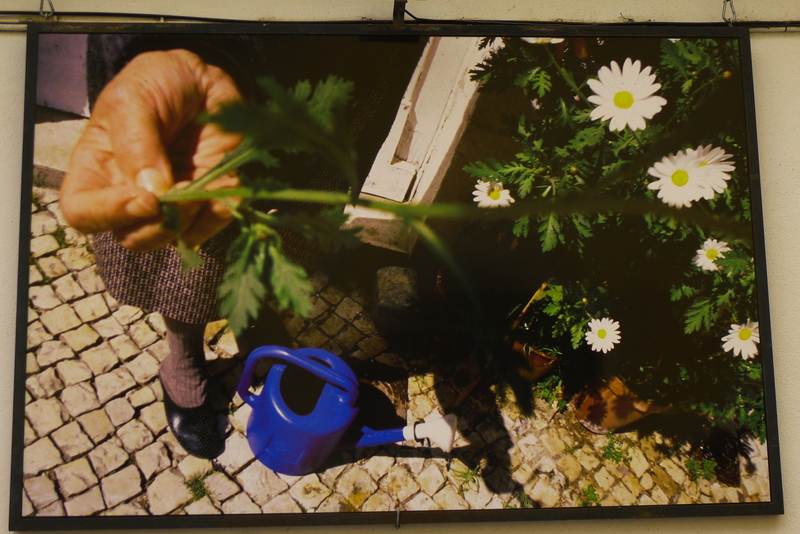 One evening, as we come down a narrow set of steps in the Alfama district of the city, we get stopped by a woman who instantly involves us in a long story about her plight. She says she is ashamed of her situation, she doesn’t want to beg for money but if we could have a look at her wares, maybe we would like to buy something? I tell her that we are travelling light and therefore don’t want to buy anything that we don’t actually need, but we’d be willing to have a look but here is nothing there for us… Her story is heartbreaking and quite confusing, how she hasn’t got enough money for food, she moved to Lisbon to support her daughter in her studies but her daughter left her and now she is all alone, can’t pay her bills or get food or medical treatment for terrible tooth problems. Maybe she will die, she says, as she has a strange feeling in her throat that means she can’t chew and swallow food properly. We offer to make her some soup in our campervan but she says she can’t get to Belém, so we arrange to meet her the next day in the same spot with the soup. The following day, we pack a whole box; soup I made especially for her, home made apple puree and a Kombucha culture with written explanations on how to feed it. We return to our rendez-vous at the appointed time and wait. Standing in front of an Electrics shop that has a huge television screen in its display, I’m idly watching the news, when suddenly the Charlie Hebdo shooting appears. It’s hard to understand what happened, as the subtitles are in Portuguese and of course we can’t hear the commentary. It’s hard to comprehend the ferocity of hate that leads to such an act. Frank and I both stand there, agape, speechless. The woman doesn’t turn up for her food either. I had another dream that seems too important to brush off upon waking. We were somewhere in a town on our travels. Frank and I had gone off on our own explorations. As I was crossing the market square, there was a group of old women getting out of a minibus, all dressed in some kind of ethnic clothing. I approached them to ask if there is a folk music or dance event on somewhere. When I came closer, I realized that they were really old and from some northern tribe, maybe Laplanders (Saami)? One of the women was able to communicate with me via broken English and showing me pictures of vast landscapes, sunsets and sunrises. She said I needed to start meditating every Wednesday evening at 8pm; that this would be important for my own health, as well as for the well-being of womankind on earth. She said that on that particular day of the week and at that particular time, I would be linking into the wisdom of all women ancestors. Well. Despite having lived in Totnes for over 20 years and shared communal houses with professional meditators, I have never got into it – my meditation has always been my music practice. Is this dream going to push me into it? Probably not. It’s cold but sunny here (6 degrees). This morning we had a beautiful misty sunrise over the river in Lisbon. 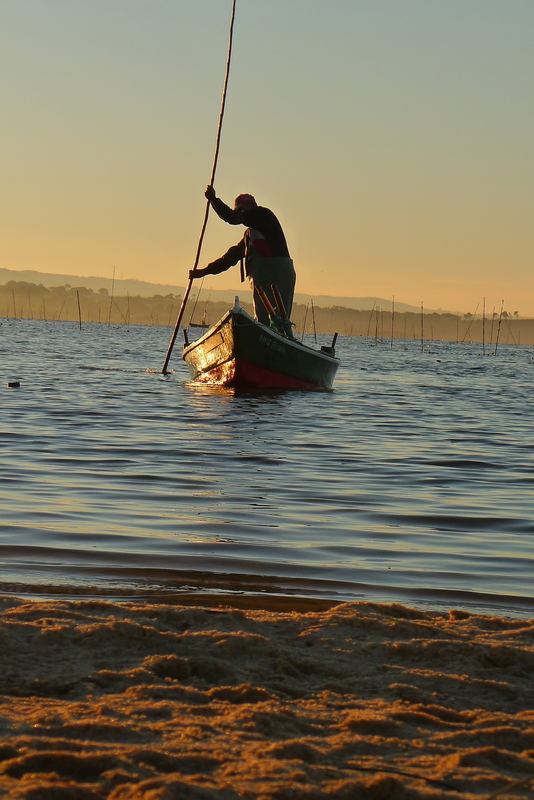 Yesterday, we made a trip into Lisbon’s forests to collect firewood, returning to a spectacular sunset over the plain. The nights are quite chilly but thanks to Terry Hackwith, our lovely stove Meme keeps us warm. We have linked in with a very friendly Tango scene and danced away New Year’s Eve with them. I’ve taught some private lessons and Frank has been giving massages to various people from the Tango scene as well as from the campervan place where we are parked up. 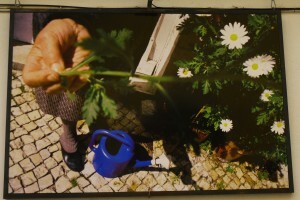 We have fallen in Love with Lisbon, but more of that in a later post. Every time we leave a place where we have had extraordinary experiences, we feel a little down and dislodged for a day or two. Kind of homeless, and whatever town we arrive in just can’t live up to the previous depth of experience. We leave Foz with just that feeling. We feel more than a little nostalgia for all the lovely people we have met there, not knowing whether we’ll ever come back there, whether we meet any of them again…. This is part and parcel of deeply connecting; we have to learn to say good-bye and let go. The next morning we drive towards the coast and then southwards. This must be surfer’s paradise, as all the beaches along this coast have surfer’s signs on them. But somehow, we don’t feel the pull to stop, despite big empty beaches and a stunning vista. 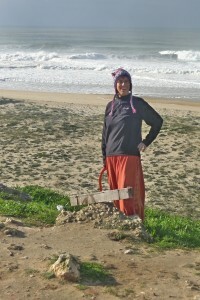 We stop for internet and food in Ericeira, a little fishing town, then move on to Sintra. We find a car park right in the heart of the town and go exploring. It is a strangely disconnected town with a number of important historical places to visit, but remember, no town can do right for us in the state we’re in! Even now, in deep wintertime, there are heaps and heaps of tourists (one shudders to think what it’s like in summer! ), everything costs a lot and you get the feeling of being in a herd of sheep, moving through the sights. This is not for us, so we decide to take the bus up to the Moorish castle and then walk back down. This is nice, free of tourists and at every turn you get another view across the landscape. Apart from this outing, we leave the beauties of Sintra to the other tourists, concentrate on writing up the blog and doing our washing at a very friendly local launderette. We have learned that this is the best thing to do after a time of expansive connections: contract back into ourselves, clean our ‘house’, stock up with wood and water, write the previous experiences down, get in touch with family, sleep, eat well etc. After a while of that, we are ready for the next adventure. 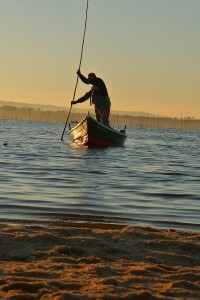 This is the point at which we leave Sintra and head for the big city: Lisboa here we come….